In our back yard there lives a pair of guinea pigs. They live in a wooden hutch, small but comfy, and we love them. 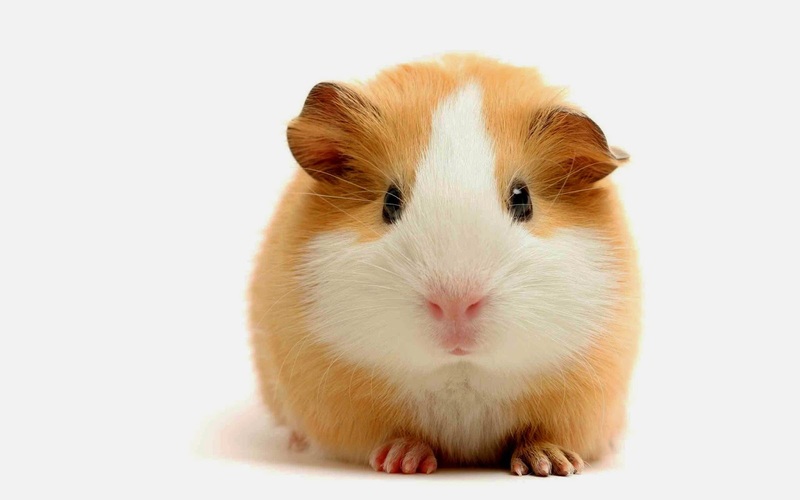 The chestnut-coloured guinea pig is named Chestnut and the ginger-coloured guinea pig is named Ginger. A couple of weeks ago we noticed that the guinea pigs were eating quite a lot yet always still seemed to be hungry. Each night we topped up their food, yet in the morning there they were, peering hungrily out from behind the bars of the hutch. We did not understand why the guinea pigs were so hungry. Not until, late one night, we noticed the adorable little brown bush rat creeping in through the bars of the hutch. There he was, whiskers twitching in the moonlight, shamelessly standing right on top of the guinea pigs' food bowl and gobbling up their food without a care in the world. The guinea pigs seemed very understanding. They ambled about unobtrusively, polite spinsters that they are, while from time to time their visitor looked up from the bowl to smile courteously, as if to reassure his hosts that the meal was excellent, quite excellent, and that everything was perfectly in order. Now your Australian bush rat is a fine little animal. He is not at all like his European cousin, the black rat, that intolerable propagator of iniquity whose nature is nothing but a laboratory of diseases drawn about by two sharp teeth and a stomach as insatiable as the grave. The bush rat is a good-natured fellow. His ears are the shape of buttercup petals, not at all like the satanically pointed auricles of the black rat. His tail is short and sweet as a lullaby, bearing no resemblance to the sinister tapered whip of the black rat. Our Australian rat has created no plagues, provoked no policies of national flooding. He has, as far as anybody knows, never devastated a civilisation. He does not invade houses. He is a rather shy, well-mannered little creature who would rather scavenge discreetly at a respectable distance from human habitations before retiring at dawn to the domestic comforts of his cosy burrow. The black rat is a problem for philosophers and experts in theodicy; he is the trump card of Manichaean heretics and all cosmic pessimists. But I bless the Australian bush rat. I have no hesitation in regarding him as one of God's creatures. If I would not, perhaps, offer him my seat on the bus, I would certainly tip my hat to him and wish him good-morning. And yet, reader, the dear little critter is dead, for I have killed him. I would not want you to get the wrong idea: I am not habitually a murderer. Killing of any kind is prohibited in my household. I once issued my young son with a stern rebuke when he confessed that he had, with malice aforethought, deliberately taken the life of a single ant. I have on other occasions – disregarding all extenuating circumstances – prevented the children from killing each other. In order not to appear hypocritical, my wife and I have also made a conscious effort to refrain from killing one another. That's how strongly we feel about this matter. So it was no small thing when I resolved that the bush rat had to die. I did not kill him until all other avenues had been exhausted. When we learned of his existence the children created a trap for him, and for three whole days we dreamed of capturing him and making him our pet. We would place him in a cage; we would feed him; we would take his photograph; we would give him a name. No longer would he need to steal from the helpless guinea pigs, for now he would have food and every other modern luxury, all to his heart's content. But the trap was not as good as we thought. It consisted of a clothes basket, a food bowl, a stick, and a piece of string. It was not, apparently, constructed according to sound engineering principles. The smallest breeze could trigger it; a rat could stroll in and eat all the food without setting it off. Not only was the trap a failure, but it also led the rat to discover a secret that would, in the end, prove to be his undoing. We had placed the trap – don't ask me why – near the entrance to the laundry. That is how the rat learned that we have been stockpiling foods in the laundry. Huge bags of dog food, bird seed, fish food in plastic containers, sweet-smelling bags of hay, together with an entire plastic bin brim-full of the most succulent guinea pig food you have ever tasted. It was riches beyond compare. It was like discovering America. Poor little rat; how quickly power and riches can go to one's head. Two nights later, our rat had chewed through the side of the plastic bin and was draining guinea pig food right from the source. The following night he chewed through the bird seed bag for an hors d'oeuvre. He cleansed his palate with a few liver-flavoured dog treats. He munched thoughtfully on his guinea pig food. Then finally he belched like a king, cleaned his whiskers, and staggered back home, where I imagine it must have taken quite some effort to squeeze his corpulent frame through the strangely shrunken doorway, before he curled up in the deepest corner of the burrow and sank into an even deeper sleep. For ten minutes we stood in the laundry, my children and I, and contemplated the crime scene. Step by step we followed the trail of wanton culinary destruction. We inspected the torn bird seed bag and the nibbled liver-flavoured dog treats and the scattered guinea pig food. We took measurements. We examined evidence under UV lights. We made sketches in yellow notebooks. We interviewed witnesses. (The guinea pigs weren't saying a word. Typical.) We observed that the gap under the laundry door is unnaturally wide, easily wide enough for a small Australian bush rat. He had discovered the laundry and from now until the end of the world there would be no way to keep him out. I kissed my children goodbye. I left the laundry and drove straight to the store and purchased a mousetrap. Three dollars seemed too small a price for such a lethal apparatus. I followed all the directions on the packet. I spread the trap with peanut butter. I placed it in a suitable location. I said a prayer for the death of the rat. "Thank you, O God, for this fine small creature that you have made. Thank you for his cunning ways and his indomitable spirit. Help me now, I pray, to kill him." But the mousetrap did not kill him. Two nights later he had still not eaten the peanut butter, the trap had not been triggered, and I had not woken up to find him lying in a pool of blood with a broken neck and a look of disappointment on his face. Poor rat. The mousetrap would have been so swift and painless. Even for a human being, a mousetrap would not be a bad way to go – especially if you got a taste of peanut butter just before the bitter end. Out comes the bush rat, sauntering across the lawn. He can hop – did you know that? – like a tiny kangaroo. All that guinea pig food really puts the spring in one's step. Hop, hop, hop, over to the guinea pig hutch. He goes inside, orders a drink, chats at the bar for a while with Chestnut and Ginger. Then he's off again. Squeezes through the bars. Hop, hop, hop. Now he's outside the laundry. He's seen the food. His whiskers twitch suspiciously: you don't get to survive on the Australian continent for a million years without having razor-sharp instincts. But no. Poor little chap, his instincts have let him down. Like so many noble men before him, his greed has been his downfall. Quick as a flash he chews through the first poison pallet, then the second. Later, on his way home that night he bids farewell to the guinea pig sisters, who wave their silk handkerchiefs in the air as when a friend departs for a long and lonely voyage. When I found him two days later dead on the lawn, he was curled up like a sleeping mouse. From the look on his face you would have thought he was dreaming. I came inside and told the children that our bush rat was dead. My son wanted to know what I had done with the body. I explained that I had placed it in a plastic bag and tied the bag shut and dumped it in the rubbish bin. I saw the shocked disapproval on my son's face, and all at once I understood that there was no getting around it: we would have to give that rat a Christian burial. So now we have laid his bones to rest, and I have written him this eulogy too. No rat could ask for more.